Milk allergy is one of the more common food allergies and affects many people. It’s a result of an abnormal immune response to the constituent parts of the milk from any animal (the most common allergy response is due to alpha S1-casein, a protein in cow’s milk). Milk-induced allergic reactions can range from mild to severe and can lead to anaphylaxis, a potentially life-threatening condition. Milk allergies are believed to affect up to 3 percent of children under the age of 3. Although it was once believed that these allergies would be quickly outgrown, many recent studies have challenged that notion. One study found that less than 20 percent of children with milk allergies had outgrown their allergy by their 4th birthday. There is hope for milk allergy sufferers though: approximately 80 percent of children do outgrow their allergy by mid-adolescence. As one of the most common food allergies, people with an allergy to cow’s milk should also be aware there is a good chance they may also be allergic to milk from other animals, including sheep’s and goat’s milk products. Anaphylaxis—a rare but potentially life-threatening reaction that affects breathing and can lead to shock, and eventually death in extreme cases. If you or your child experiences any of these symptoms, be sure to see an allergist. If you or your child suffers an anaphylactic reaction seek emergency medical care immediately. It is likely that the emergency room doctor will recommend you consult with an allergy specialist to prevent future reactions. 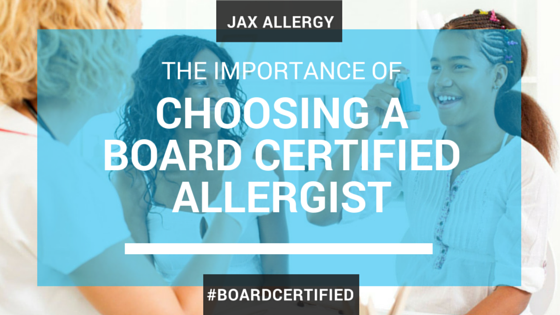 Allergists are the food allergy experts. So if you suspect you have a milk allergy you should make an appointment with an allergy specialist to discuss your concerns. At your appointment a detailed personal history will be taken, including the foods you typically eat, symptoms you experience, how long the symptoms lasted and what, if anything, you did to alleviate the symptoms. In most cases your allergies will be diagnosed by either skin-prick test or a simple blood test. For the skin-prick test, a small spot on your forearm or upper back will be lightly pricked with a small toothpick-like device containing a tiny amount of milk protein extract. If you have a milk allergy you should develop a small hive where your skin was pricked—this usually happens within 10-15 minutes. With the blood test, a blood sample taken and tested for the presence of Immunoglobulin E (IgE) antibodies. These are antibodies produced by your body in response to an allergen. The blood test results will be reported as a numerical value. The higher the number, the more likely you are truly allergic to milk. Avoidance of foods and drinks containing milk protein is the only sure-fire way to manage milk allergies. People with milk allergies and parents of children with this allergy must carefully read all ingredient labels. Luckily for allergy sufferers, milk is one of the allergens that have specific labeling requirements thanks to the Food Allergen Labeling and Consumer Protection Act of 2004. This law requires all food sold in the US to clearly identify and label whether milk or milk products (or other specific allergens) are included in their foods. Some milk allergic people can tolerate foods containing milk that have been cooked or extensively heated. Your allergy specialist can help determine whether you or your child can tolerate milk in baked goods or if all milk products should be avoided. For infants with milk allergies, your pediatrician or pediatric allergy specialist can help you determine the most effective infant formula to give your baby. Since food allergies are some of the most dangerous and one of most common causes of anaphylaxis, patients with milk allergies should carry an epinephrine auto-injector with them at all times—as this is the only immediate treatment for anaphylactic shock. If your child has the allergy, teachers or other caregivers should know of their condition and understand how to properly use the auto injector. A dairy allergy and lactose intolerance are not the same thing. Milk allergies are a reaction from your immune system to a protein (casein) found in milk—your body treats this protein as a dangerous invader and mounts a response to the allergen leading to hives, stomach discomfort, vomiting and even anaphylactic shock. This can be a serious medical emergency. Individuals who are lactose intolerant have digestive systems that have trouble digesting (or cannot digest) the sugar in milk (also known as “lactose”). Lactose intolerance is a result of a lack of the enzyme lactase, which is required by the body to metabolize lactose. A lack of this enzyme leads to stomach discomfort, gas, diarrhea, and sometimes vomiting, but it is not medically dangerous. If you are suffering from stomach problems or are having reaction after eating dairy-containing foods, you should contact an allergy specialist to schedule an allergy test to determine if you have a milk allergy or if there is some other issue.